Most Westerners would typically have a hard time finding Mongolia on the map. Nevertheless, it’s a rather unique state that serves as home for well over 3 million people. It turns out that it has an incredibly rich history as well, that is closely tied to its two closest neighbors – Russia and China. However, what some might not know is that Mongolia’s foreign policy has undergone a major shift in recent decades. Although Ulaanbaatar traditionally maintains close ties with Russia and China, it has also been searching for a technologically advanced and financially sound “third neighbor” to counter-balance the interests of its two leading partners. The task of finding this neighbor is enshrined in both in Ulaanbaatar‘s national security and foreign policy programs, that are known as ‘concepts’. Both Japan and South Korea have been aspiring to become this third neighbor for Mongolia in recent years, taking advantage of their strong geopolitical position and relatively close geographical proximity to Ulaanbaatar. However, since the end of the twentieth century Washington has been hard at work establishing ties with this Central Asian state. Back in 1987 when the United States formally recognized Mongolia as a sovereign state, initial contacts between Washington and Ulaanbaatar were highly formal. In the first couple of years of official diplomatic contacts the US would establish its embassy in Ulaanbaatar and Mongolian would soon open the doors of its first diplomatic mission to Washington. Yet, as the time went by, the relations between the two countries began growing relatively fast. At this point it is only logical to question the rationale behind this process, since it remains unclear why such a distant and comparatively small state, like Mongolia, would spark massive interest in Washington and its think tanks. First of all, there’s an abundance of natural mineral reserves in Mongolia, including copper, molybdenum, tungsten, coal, gold and the list goes on. Couple with this fact the cheap labor force and environmentally friendly agriculture and things become more clear. Now, finally, the better part of Mongolia is scarcely populated, which means that the costs of building and maintaining facilities in this state are negligible in comparison to any other country that the West describes as a partner. Bilateral ties between Washington and Ulaanbaatar have been booming for decades, with all sorts of ties growing at a breathtaking rate, including economic, political, social, cultural, scientific, and of course military ties. And one could hardly expect anything else in a situation, where the US has been particularly generous in its approach to this Central Asian state. The US Agency for International Development (USAID) in the period from 1991 to 2011 has allocated more than 220 million dollars to support free trade, agriculture, and health in Mongolia. And for sure, it’s been promoting US-style “democracy,” by meddling directly in local politics. However, the above mentioned agency wasn’t the only Western entity interested in establishing a foothold in Mongolia, as the Millennium Challenge Corporation (MCC) has also been providing millions of dollars in grants to Ulaanbaatar annually. Now, for well over a year we’ve been bombarded with allegations of Russia’s interference in the presidential elections in the United States, with no facts being presented to us so far. However, when it comes to Washington directly interfering in all sorts of elections overseas, even when this interference is documented, it admits no wrongdoing on its part whatsoever. This statement can be illustrated by the dubious activities that American NGOs in Mongolia have been involved in, in particular in the 1996 Mongolian parliamentary elections. It seems that, afterwards, the resulting government eagerly opened the doors of the Mongolian economy to American special interests. The then ambassador of the United States to Ulaanbaatar, Alphonse La Porta would state in one of his speeches that Washington has a stake in Mongolia, due to its unique geopolitical position, since it’s situated between the Russian Federation and the People’s Republic of China. This results in the United States ranking in the top ten countries investing in the Mongolian economy today. And in spite of the fact that Mongolia carries on cultivating close ties with its major neighbors, Russia and China, Washington has no intention of releasing its tight grip. The total amount of official American investments in Mongolian industry over the last decade surpasses 310 million dollars. Basically, those are investments in local mining operations. For instance, one of the largest private coal companies in the West is determined to go after the Tavan Tolgoi coal deposit which is believed to hold up to 6.5 billion tons of coal. Another American corporation, Nova Mining Corp, produces lithium in the aimag (province) Bayankhongor. Additionally, there are huge uranium reserves located in Dornod in the east of Mongolia. This fact predetermined a fierce battle of foreign companies competing for the right to extract this valuable resource which started as early as 2011. The massive GAGE International was forced to establish a uranium mining company Mongolia Forward in a bid to force both Russia’s Atomredmetzoloto and the China National Nuclear Corporation out of this market. The United States has also been expanding its cooperation with Mongolia in the military sphere. Back in 1996, Washington and Ulaanbaatar signed an agreement that established a framework regarding mutual joint military exercises. After the initial US invasion of Afghanistan back in 2011, Mongolia would join so-called “anti-terrorist” efforts. Mongolian troops supported the Pentagon in the Iraq war: with its servicemen carrying out a wide range of both military and humanitarian operations up until September 2008, when Ulaanbaatar made a decision to withdraw its forces. 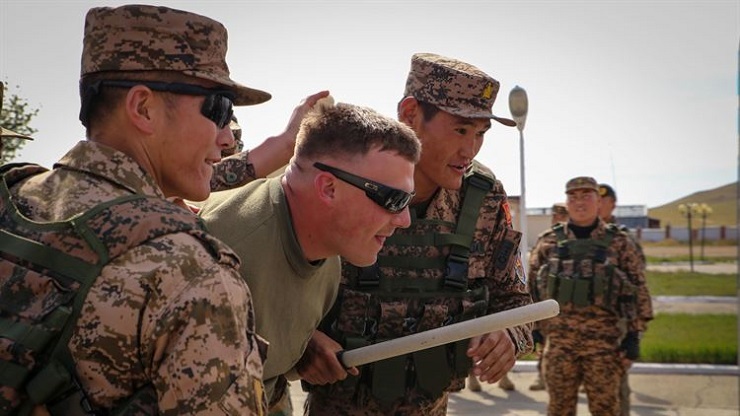 It is particularly curious, that during the deployment of Mongolian troops in Afghanistan and Iraq, all the costs, including the pay for rations, equipment, weapons and uniforms, were covered by the United States. In early March, US Assistant Secretary of Defense for Asia and Pacific Security Affairs, Randall Schriver paid a three-day visit to Mongolia, where he would discuss the prospects of further bilateral defense cooperation with local authorities. As a result of this visit, the US Embassy in Ulaanbaatar announced on its website that the US Department of Defense searches for candidates wishing to study at the United States Military Academy, the United States Naval Academy and, for the first time, the Academy of Military Science. It has also been mentioned that those who are to become cadets will be receiving scholarships as well. Despite the fact that Mongolia is trying to pursue a multi-pronged foreign policy, trying to maintain good-neighborly relations with its two actual neighbors – China and Russia, the United States has recently been putting ever increasing pressure on Ulaanbaatar to side with the United States should policy decisions come down to deciding between Moscow, Beijing, and Washington. In an effort to show Ulaanbaatar that Mongolia is progressing up the list of principal allies of the United States in the region, Washington even offered this country a chance to organize a personal meeting between US President Donald Trump and North Korea’s leader Kim Jong-un. This, in particular, was discussed in Washington during the recent visit of the Mongolian Foreign Minister, Damdin Tsogtbaatar to the US. These days Mongolia is in a position where it must find a solution to the problems of social stability, shortage of military professionals, and a technological gap. When we’re speaking about the assistance provided to Ulaanbaatar so far in this domain, Russia and China have made a much better commitment than the US. Mind you, that there’s campuses of Russian and Chinese institutes operating on the territory of Mongolia, while the US isn’t willing to go down that route. Moreover, several generations of Mongolians have been speaking Russian as their second native language. Therefore, it seems unlikely that Washington’s aspirations of breaking the ties between Ulaanbaatar and its two closest neighbors will ever be fully realized.